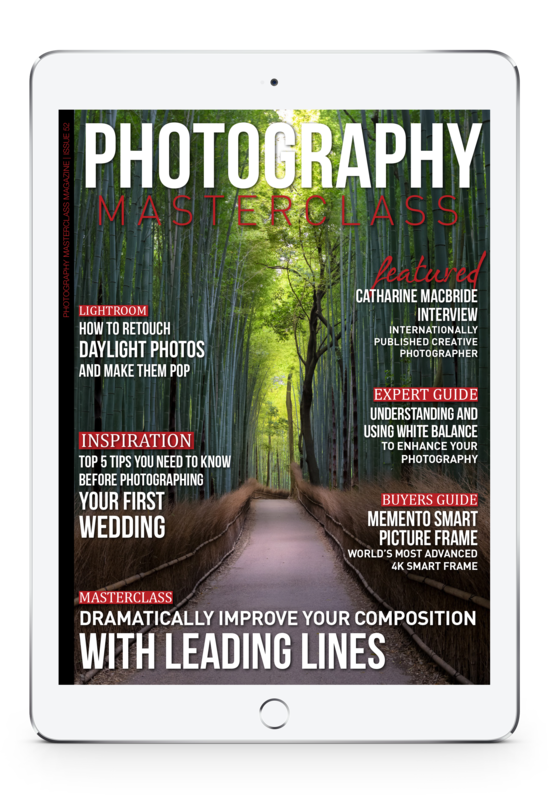 Learn How To Dramatically Improve Your Composition With Leading Lines, In This Issue of Photography Masterclass Magazine! One of the most powerful composition tools photographers have at their disposal is making use of leading lines. In this issue we look at exactly how leading lines can dramatically improve your images, and how you can use them to best advantage in your photography. Once you realise how important leading lines can be, you'll begin to see them everywhere, and they'll soon become a solid and dependable tool in your creative photography arsenal. + Professional wedding photographer, Chris Garbacz, shares what he considers his top 5 tips that every photographer needs to know before photographing their first wedding. + In our expert guide, we look at how understanding and using white balance effectively can seriously improve your photography. + We interview creative photographer, Catherine MacBride, whose images have been used internationally in a huge number of places from book covers to children's clothing. + You'll learn how to how to retouch daylight photos and make them pop in a great Lightroom video tutorial. + We showcase an incredible 8K timelapse, which is the culmination of tens of thousands of images shot, and presents the beautiful variety of Norway at its best. + We also give you the lowdown on the world's most advanced 4K smart digital picture frame.